Find out which apps can make your holiday more like heaven, and save you money along the way. From phone calls to food – make your phone pay its way abroad. Heading abroad? Your smartphone can save you serious money – and improve your time away. From flights for less to local food tips, download these apps and have a better holiday, for less. Meta-search apps are ubiquitous for financial products, and flights should be treated just the same. Skyscanner lets you compare multiple airlines, alternative routes and nearby airports simultaneously. Kayak, Momondo and Seatguru all do the same thing, but in one test by The Telegraph, Skyscanner came out 1% cheaper than the rest – and significantly, found one flight from Manchester to New York for a massive £75 less than the others. Hipmunk does flights, hotels and car rentals, but it’s hotels where it really shines. 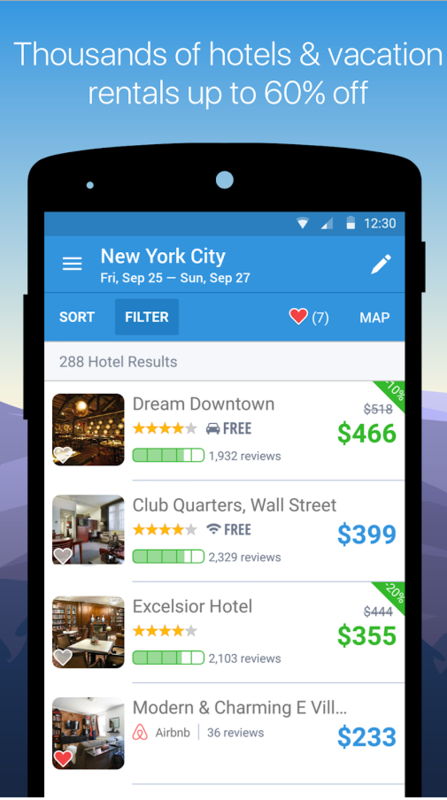 Similar to Skyscanner, Hipmunk is a meta-search app and covers all the major accommodation providers: Airbnb, Booking.com and Hotels.com among them. Meta-search apps often fall down on complicated, obtrusive interfaces, making Hipmunk’s fun and easy UI stand out amongst the crowd. Bonus app: For spontaneous travellers, try Hotel Tonight – an app dedicated solely to last minute bookings. If you don’t mind not knowing where you’re staying until at most a week ahead, Hotel Tonight can save you up to 70% on a hotel room. TripCase is an itinerary app very similar to TripIt. At its most basic, it functions as a centralised repository of all your travel information – send all your confirmation emails for bookings and reservations to TripCase and the app will automatically organise it all into an easily accessible travel hub; including a timeline based itinerary, making your journey a simple case of step-by-step. Where TripCase excels is in the additional information it adds for each leg of the journey, making it easy to find things like driving directions and alternative flights. Invaluable in a pinch. Fancy paella in Madrid? Quesadilla in Mexico City? Bhuna on Brick Lane? 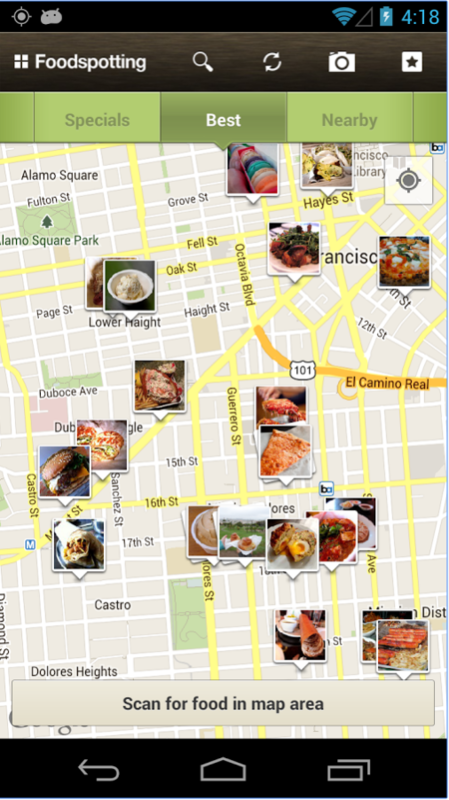 Foodspotting aggregates user recommendations, giving you food tips from the locals, and arranges them by dish type – even giving you directions once you’ve made your selection. So whatever you’ve got a hankering for, you can sidestep the tourist traps and follow the wisdom of crowds to the best meal in the city. Live maps are so much more useful than the paper variety, but if you want to save on roaming data charges you need to look into offline maps. This means you can download areas to your phone and use WiFi signal for positioning instead of eating up megabytes of mobile data. EU roaming charges are due to be abolished next summer (2017), but once Britain leaves the EU, prohibitive charges could be reinforced. Either way, if you need to make calls before roaming is history, or if you’re travelling outside the EU, there are a number of apps to make phoning home much cheaper than the Euro bundles your operator offers. 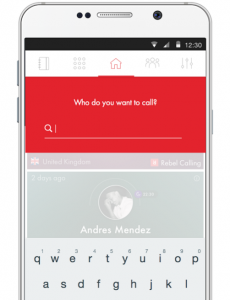 If you can find Wi-Fi you can phone home for free with WhatsApp or Skype, but Rebtel lets you make reliable international calls for next to nothing when you’re out and about without internet. Rebtel works by hi-jacking local lines for international connections, so you can make cross-border calls without internet lag or 3G dropouts. £7 per month gets you unlimited calls to the UK, or 181 minutes to mobiles on Rebtel’s World Credits system (which also lets you call other countries). Even better, get your friends and family to download the app and call them for nothing – Rebtel users can speak for free until 2017. Bonus app: If you’re determined to keep calling free, Wi-Fi Finder scouts out the nearest free Wi-Fi you can use for WhatsApp or Skype. Just be warned – public Wi-Fi is often strained, and the VoIP lag struggle is real. Have we missed anything? What apps do you use to enhance your holiday or save you money abroad?